Tyler MFA graduate and faculty member Amber Cowan is the event's featured artist. 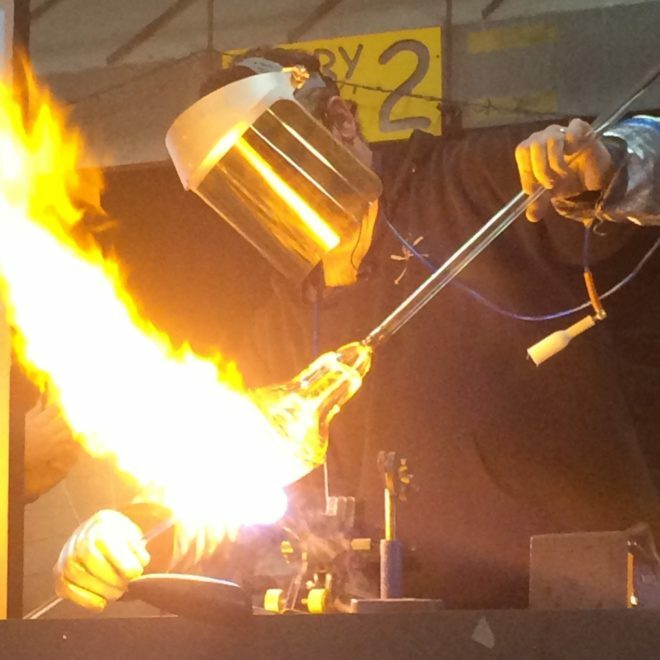 The upcoming international flameworking conference, which will run from March 24th through 26th at Salem Community College in Carney's Point, New Jersey, will be the 17th gathering of artists specializing in borosilicate glass. It will also mark a notable shift as many of the featured speakers and demonstrators are graduates of fine-art-degree programs, including the featured artist Amber Cowan. Throughout the programming of the three-day event which has recently featured highly skilled flameworkers such as Eusheen Goines (2016), Vittorio Costantini (2013), Loren Stump (2007), Cesare Toffolo (2004), a decidedly more academic tone is notable, starting with the opening-night lecture on the history of flameworking courtesy of The Corning Museum of Glass's reference librarian Beth Hylen joined by the museum's properties of glass programs supervisor Eric Goldschmidt. Featured artist Amber Cowan not only holds an MFA in glass and ceramics from Tyler School of Art of Temple University, but is also on faculty. 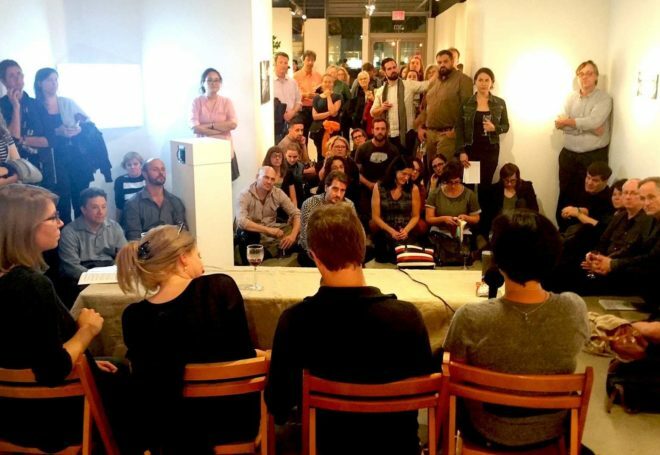 Other presenters include Beccy Feather, Jacob Moskowitz, Zach Puchowitz, Ryan Tanner, and Kim Thomas, all of whom studied art at the university level. The GLASS Quarterly Hot Sheet checked in with conference co-chair Amy LeMaire to learn more about the lineup for the 2017 event. 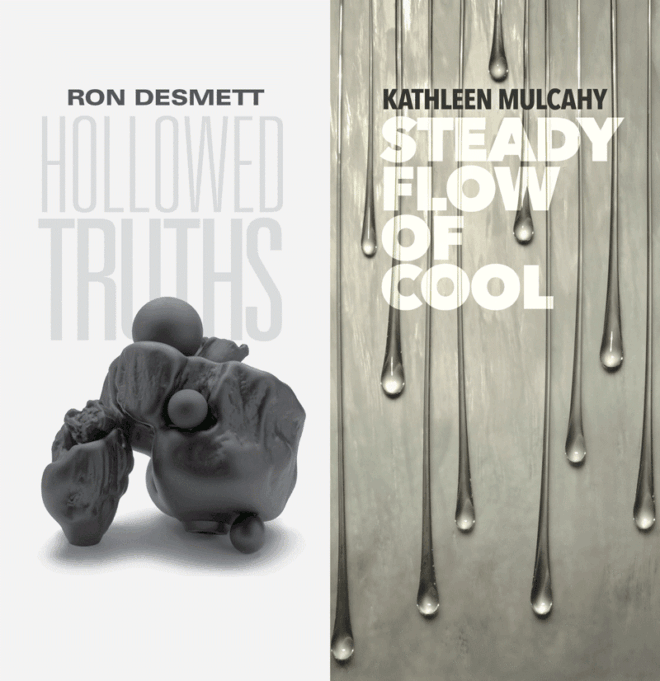 The late Ron Desmett (1948-2016) and his wife, Kathleen Mulcahy will both have their work featured at Alfstad&amp; Contemporary, which will kick off the Third Annual Sarasota Art Glass Weekend on January 27th. A collaboration between Longboat Key Center for the Arts, a division of Ringling College, and Habatat Galleries of Michigan, the weekend event will include exhibitions, auctions, studio tours, talks by internationally-known artists, glass-blowing demonstrations, and private tours of the museum featuring glass. The event's opening reception will take place on Thursday, January 26th. North Lands Creative Glass has announced its 2017 summer program, its first under recently appointed artistic director Jeffrey Sarmiento. The program of classes and a conference will be centered around the theme of faith. 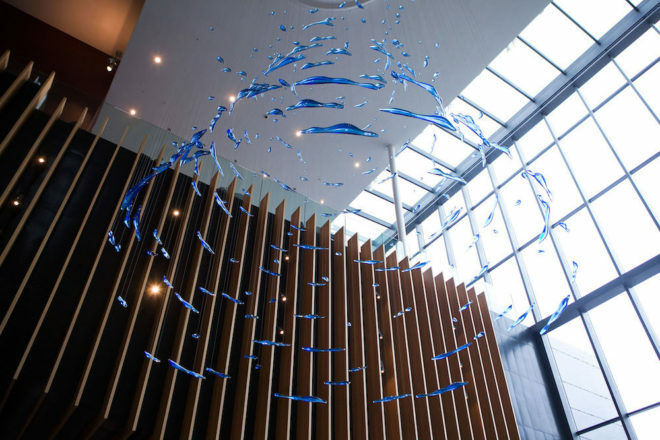 The program, titled "Leap of Faith," is billed as exploring the relationships between glass and belief in its varied forms &mdash; religious belief, social dogmas, and artistic conviction. Master-classes will be headed by artists Anne Vibeke Mou, Annie Cattrell, Beth Lipman, and the duo of Michael Schunke and Josie Gluck. The one-day conference, "Taking a Leap: Concept, Conservation and Innovation in Architectural Glass," is organized in collaboration with Bullseye Glass Company, and will take place on July 16th, 2017, in the county of Caithness in the northern reaches of Scotland. UPDATED 01/10/2017 For it's 47th annual conference, the Glass Art Society is going overseas for the first time since the 2005 Adelaide, Australia, conference sent intrepid artists on long-haul flights Down Under. 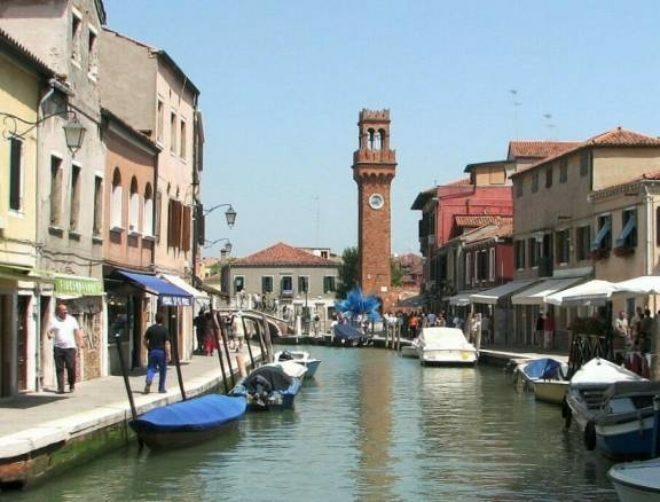 The 2018 event is set to take place in Murano, Italy, from May 16th through 20th, a notably longer duration than recent conferences, which have been three-day affairs. Led by Lino Tagliapietra, the conference steering committee for 2018 includes Cesare Toffolo, Lucio Bubacco, Davide Salvadore, Marina Tagliapietra, Roberto Donà, Adriano Berengo, and the Consorzio Promovetro Murano, an association of craft and industrial businesses in Venice dedicated to the preservation and promotion of Murano’s artistic glass and centuries of history. 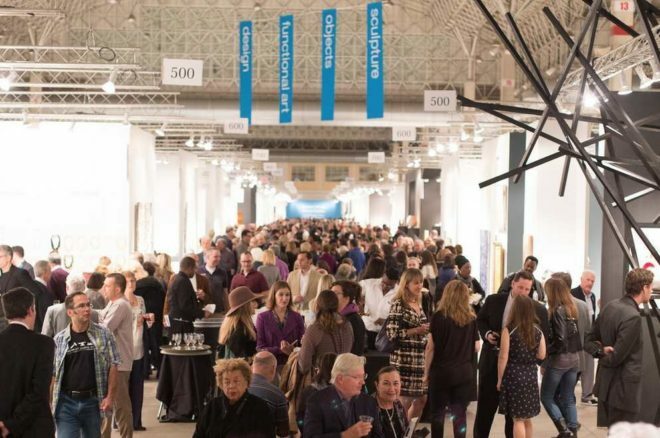 In the gallery above, the GLASS Quarterly Hot Sheet presents its annual "Red Dot Report," surveying works that sold at the SOFA CHICAGO art fair in early November. With the Chicago Cubs historic World Series win, and their celebratory parade the following Friday impeding access to Navy Pier, this year's SOFA got mixed reviews from exhibiting dealers. Maurine Littleton, owner of Maurine Littleton Gallery, in Washington, D.C. said that while this year's fair was better than last year, the pre-election contentious political climate and the Cubs crowds weren't helpful to sales. While the overall the fair was okay, it didn't match the really strong SOFA she had in 2014, said Littleton, adding that the two subsequent years have fallen flat. Kurt Nelson, owner of Palette Contemporary Art and Craft in Albuquerque, New Mexico, said that while the show was big enough this year, there was so much work in glass that it seemed almost saturated. 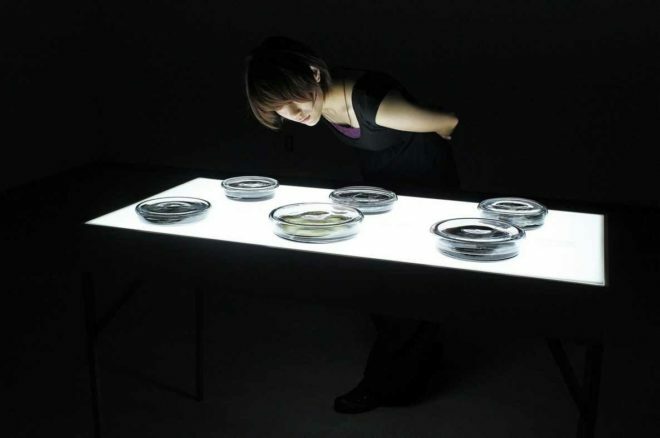 Rui Sasaki, Object Lessons "Residue" (overview), 2014. Glass, ash (from plants in Awashima), fluorescent light, mineral oil. H 31 1/2, W 23 1/2, D 47 1/4 in. Project at the Awashima Artist Village, Kagawa, Japan. Japanese native Rui Sasaki has been named the 2016 Borowsky Prize winner, a $5,000 award named for the late University of the Arts trustee Irvin J. Borowsky, and awarded by the Philadelphia arts institution each year. 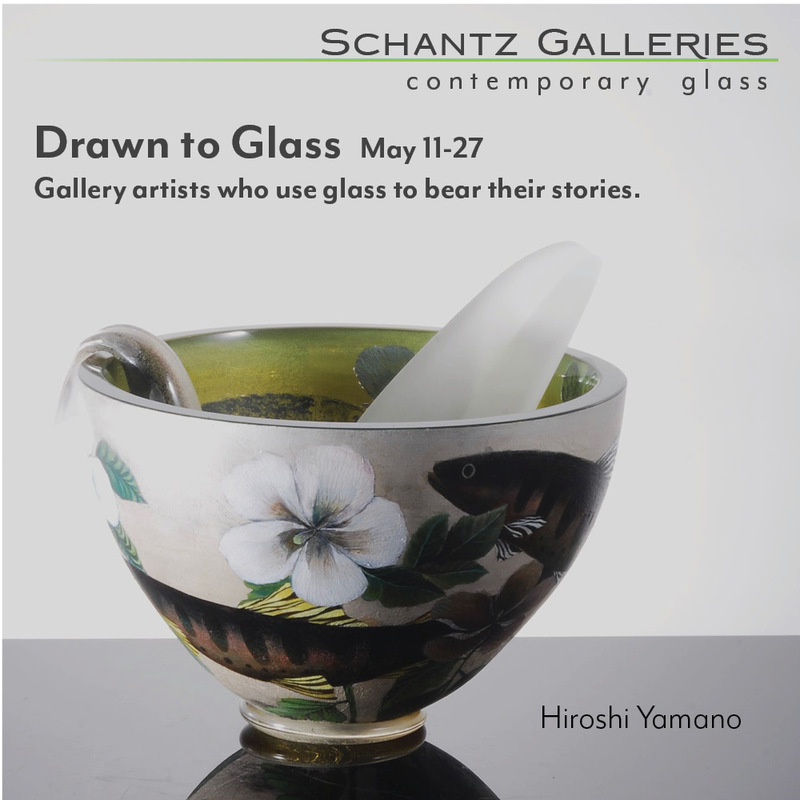 The prize seeks to identify "an artist whose work is conceptually daring, exemplifies technical skill and innovation, and advances the field of contemporary glass," and includes the invitation for the winning artist to present a lecture. Sasaki, who is currently based in Toyama, Japan, will deliver her lecture on November 10, 2016. In addition to the top prize, juror's awards have been given to prize finalists David King (who also won a juror's award in 2015) and Sean Salstrom. Sarah Blood creates pieces for her exhibition "Between Further and Farther," at the Chrysler Museum Glass Studio, one of three partners in the NEAR residency program. courtesy: the meridian group. A new Norfolk, Virginia, residency collaboration between The Chrysler Museum of Art, Glass Wheel Studio, and the Rutter Family Art Foundation, has culminated in “Between Further and Farther,” an exhibition currently on display at the Rutter-family-owned gallery and nightclub, Work|Release. Mixed-media artist Sarah Blood &mdash; the first recipient of the New Energy Artists Residency (NEAR) &mdash; used her residency to wrestle with ideas of actual and perceived distance and explore different ways to engage with the form of the paper airplane. The outcome, “Between Further and Farther,” incorporates mixed-media sculpture, large-format photography, video, and performance. Art goers of the Hampton Roads area can view the exhibition at Work|Release until September 24th. Carrie Fertig, Film still from La Sireneuse picturing Fertig's glass instruments. Photo: Rob Page. Image courtesy: Carrie Fertig. 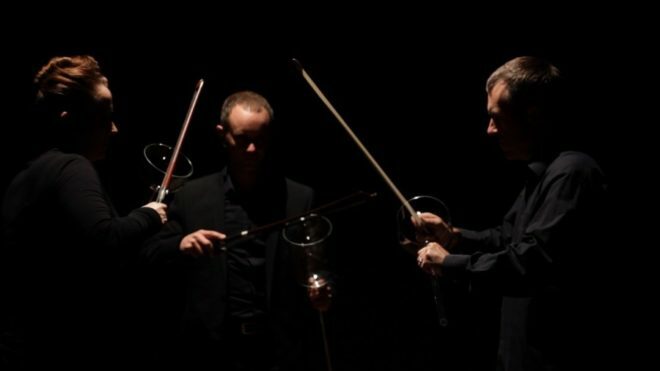 Reprising its 2012 performance at the International Festival of Glass in Stourbridge, England, the collaborative multi-media group Torcher Chamber Arkestra that combines flameworked glass, fire, and percussion-heavy musical performance is being brought back to England for another audience-interactive, glass-centric appearance. On September 2nd and 3rd, 2016, the Birmingham arts center known as mac birmingham will be filled with the sights, sounds, and spectacle that is an Arkestra performance in an event put on by Craftspace Curates, a craft-development organization that works "to push boundaries and perceptions of crafts practice, presentation and learning" through programmes of touring exhibitions, research, and participatory projects. "Pushing boundaries" is certainly something that the Arkestra, currently featuring artist Carrie Fertig, composer Alistair MacDonald, and percussionist Stu Brown, is intimately familiar with. Best described as an interdisciplinary collaborative performance group, the Arkestra defies traditional categorization by merging craft production, performance, and audience participation to create musical soundscapes produced through the manipulation of glass. 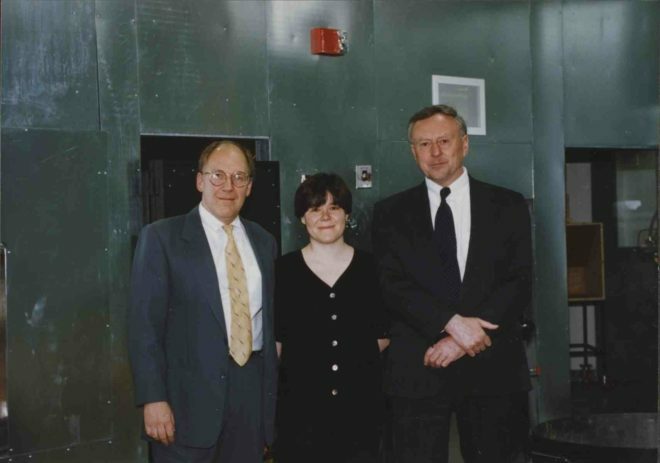 William Gudenrath, Amy Schwartz, and David Whitehouse at the opening of the Studio at The Corning Museum of Glass in 1996. In 1995, a pregnant Amy Schwartz and her husband, William Gudenrath, relocated to Corning, New York, at the invitation of museum director David Whitehouse (1941-2013) to begin the planning for The Studio at The Corning Museum of Glass, a new initiative that would redefine and expand the museum's role as a place where glass was not only studied and exhibited but also made and taught. To take their new positions as studio director and resident advisor, respectively, Schwartz and Gudenrath were both leaving jobs in New York City — she managed the computer system of a law firm on Wall Street and he was a longtime instructor at UrbanGlass (and one of the first to join its precursor, The New York Experimental Glass Workshop). The Studio at Corning opened its doors in 1996 with a block party that included an ice cream truck and guests such as gallerist Doug Heller and artist Paul Stankard. The couple's newborn daughter, Sophia, also attended the Studio's opening on May 26, 1996, taking it all in from a stroller. 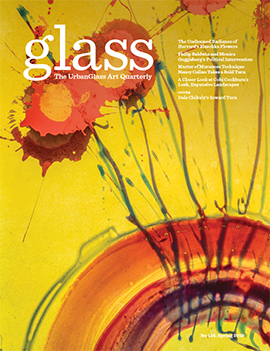 Twenty years later, as the studio has hosted hundreds of instructors and artists in residence, as well hundreds of thousands of museum visitors making their own glass, the GLASS Quarterly Hot Sheet spoke with the Studio's director about the highlights of the past two decades.